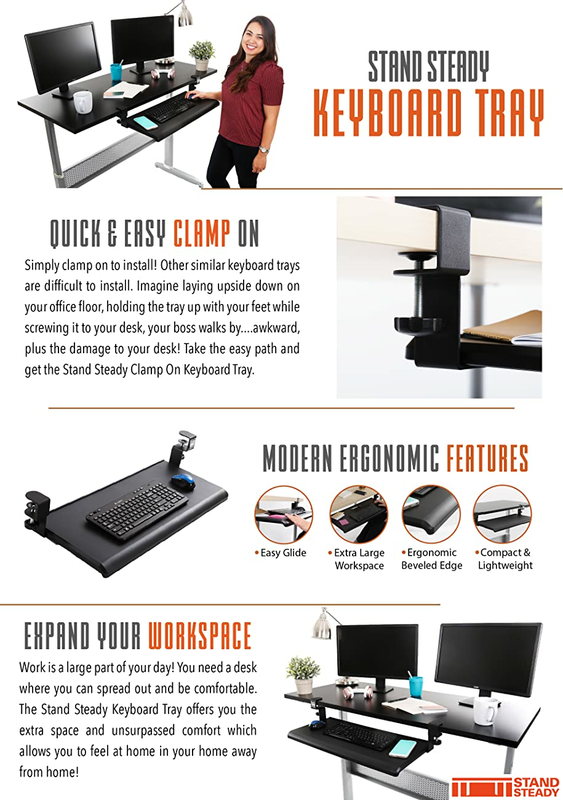 Home Desk Accessories Sliding Clamp On Keyboard Tray – 27” & With Clamp is 33"
Sliding Clamp On Keyboard Tray – 27” & With Clamp is 33"
Need more space for your keyboard, mouse, or other knick-knacks? Well...look no further! Our Stand Steady Retractable Clamp-On Keyboard Tray / Under Desk Keyboard Tray will easily attach to your desk in seconds. Due to the easy clamp-on mechanism with padding – your desk is protected! EASY ASSEMBLY: Set up your new keyboard tray in 5 minutes! No need to put holes in your existing desk or crawl under your desk! Your new keyboard tray will clamp on your desk in seconds. 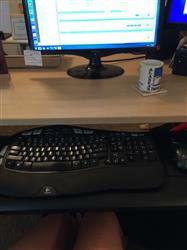 SMOOTH GLIDING TRAY: Slide your new keyboard tray under your desk and out of the way – when not in use. When you need the extra space simply pull out the keyboard tray and start using it instantly! EXTRA LARGE SURFACE: This is one of the largest and most spacious desk trays on the market! With a 12” x 27” surface you can fit your keyboard, mouse, and all your extra knick-knacks. ERGONOMIC DESIGN/ NO DAMAGE TO EXISTING DESK: Your keyboard tray has a very modern sleek design. It’s easy clamp on feature (with padding!) means no damage to your existing under desk. With your comfort in mind, it has an ergonomic beveled edge to decrease the pressure on your wrist. stable and wide. easy to install. This is a great product. I had installed a slide-out version that I had from a previous desk, but it had a lip on the front edge, was too narrow, and had 'sides' that got in the way. I needed a wide, flat surface, with no edges to get in my way. I love this. I would recommend. It's plenty sturdy enough. Yes, it will 'give' a little if you press down on it, but in normal typing, I do not notice any flex. I have uploaded photos to show my particular keyboard and mouse layout. As you can see, there is nothing to get in the way in front (nice curved edge) or on the sides (no sides at all). The mounting of course is easy. make sure you have enough width to install it. It is not height-adjustable by itself, but I used some spacers on the top, to raise the keyboard to where I needed it. It's about as rock solid as you could get. The further out you pull it, the more it will 'give' up and down. But I have it fully retracted, and it works fine. One reviewer noted that they wanted it to 'roll' easier. I disagree; if it rolled easily, it would constantly get pushed back under the desk, as you type. It's very easy to push back under the desk when you're not needing it. But it has the friction you need, to keep it in place while you work. I have been using it for about 3 weeks now and I move it in and out frequently. It has performed exactly as I wanted. I read the dimensions and this one is slightly wider than other similar models, which is what I needed. The keyboard tray is solid, simple, easy to install. You screw in the clamps to the tray with the provided screwdriver and screws, then tighten the clamps onto the table/desk surface you're using. it's not totally smooth to pull out and push in, but that may come with use, and doesn't bother me (yet) as it stays in the open and closed positions well. It's also quite large enough for a keyboard with a 10key, plus a mouse pad. I've already taken it off and on a few times, and it's easy peasy. Great alternative to buying a tray you have to permanently attach with screws/drilling, etc. This keyboard was so easy to put together along with the fact that it is large enough for my oversized keyboard and mouse together it was one of the best purchases ever. It just clamps to my desk so I can use it several places if I choose to. I didn't want to damage my desk with a tray that had to be ******* into the desk. This tray is not bad, but it can be a little wobbly. This is exactly what I want and need! Super simple to install! It fits my ergonomic keyboard and mouse! I am so, so pleased! Love it! Thank you!! !